Government parties took a drubbing in Finland’s parliamentary election on Sunday as Prime Minister Juha Sipilä’s Centre Party polled its lowest general election result ever with just 13.8 percent of the vote to lose 13 seats with all votes counted, while hard-right populist Finns Party came second with 39 seats, just one behind the Social Democrats' 40. Sipilä, a former businessman, had promised to bring the efficiency of the private sector to government as prime minister. However his administration’s austerity policies and labour market experiments such as a contentious so-called activation model ruffled many feathers. Reacting to the results on Sunday, Sipilä said that the party was the evening’s biggest loser. "We are the biggest loser and that must be acknowledged. The people have spoken," he added. "We have made it very clear to everybody that we are open to cooperation with everyone but not at any cost," Halla-aho said. "We could not join a government which is not committed to reducing harmful immigration to Finland," he added. Party leader and former union boss Antti Rinne told Yle News that he is likely to focus on a few key issues in government. "I hope we can solve this unemployment situation we have in Finland nowadays. It’s pensions, students, and child families are not doing so well in Finland now," he noted. The NCP ended the evening with 17 percent voter support, just trailing the populist Finns Party. 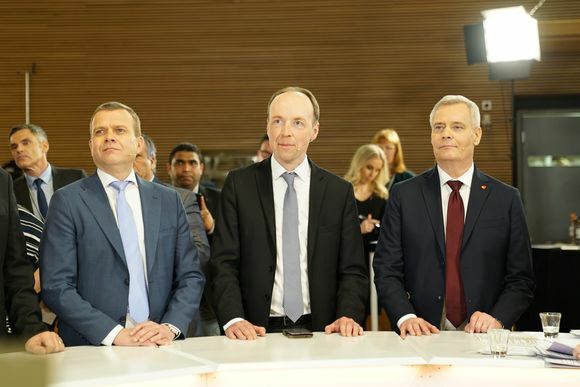 The SDP and the NCP have not always seen eye-to-eye, but party chair Petteri Orpo did not rule out both parties cooperating in government. "Of course it is possible if we find a common programme for the government. Our red lines are the economy. We want to keep public finances in balance and we want Finland to be an active member of the EU. And our main target is to get the unemployment rate to a Nordic level," Orpo told Yle News. The election was a hotly-contested race in which no single party was able to harvest 20 percent or more votes -- a situation that analysts described as unusual. The outcome reflects what pundits are calling an increasingly fragmented political landscape in Finland. "People are looking for options. They have not been satisfied and that’s why we have seen the growth of support for the Finns Party and the Greens," said political commentator Sini Korpinen, a frequent contributor to Yle News’ All Points North podcast. "The age when three big parties take turns in government or in opposition are over. It’s time for politicians to figure out how to make things work," she added. This year a record number of people -- more than 1.5 million or 36.1 percent of the electorate -- opted to cast their ballots early during advance voting. Early voting activity increased by about four percent compared to the previous general election. The overall voter turnout was 72 percent, up from 70 percent in the last general election in 2015. Korpinen told Yle that the outcome reflects the highly polarised nature of the election. "It’s going to be very hard to negotiate a government, maybe the hardest ever. Anything can happen." Edit: Updated at 1.02am to reflect final result with all votes counted.